"In 1921 management of the Depot was transferred from the Royal Marine Garrison to the Royal Australian Navy." A Google search produces about 14 references similar to the above; all are incorrect and have resulted from uncritical copying from a single source. This claim probably had its origins in a brief history of Newington prepared about 1968. It has been "copied and pasted" often since then. There was no Royal Marine Garrison in NSW in 1921, and none in 1897-98 when the Newington Magazine was constructed. British "garrison" troops departed Australia in 1870 when the colonies assumed responsibility for their own military defence. A few Royal Marines worked from time to time at the Royal Navy Ordnance Depot on Spectacle Island, or at Garden Island, up to their handover to the RAN in 1913, but did not constitute a separate force requiring an explosives magazine for its support. The claim is also counter-intuitive. At the time of the first construction (long-delayed) at Newington in 1897, the Royal Navy ammunition and explosives were located at Spectacle Island, which seems to have been adequate for its purpose as it was being actively expanded through the 1890s and early 1900s. 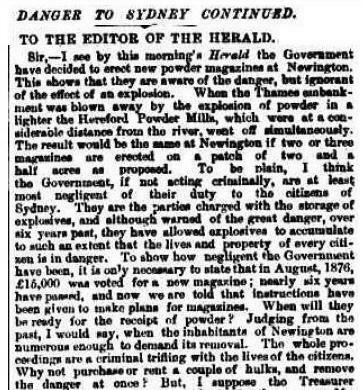 There is abundant evidence in reports of parliamentary debates in the pages of the Sydney Morning Herald during the 1870s and 1880s that Newington was an endeavour of the NSW colonial government, to relieve overcrowding at the Goat Island magazine and other explosives storages around the harbour, such as Berry's Bay, which was used by the Torpedo Corps, an element of the New South Wales Military Forces. The explosives in question comprised "merchant's powder" (i.e. commercial explosives, by that period comprising more than just gunpowder) and the ammunition and explosives used by the New South Wales Military Forces. An early reference is from the Sydney Morning Herald of 27 October 1875, page 7, reporting the recommendations of a Board appointed by the government of the Colony of NSW into the removal of the Goat Island magazine. 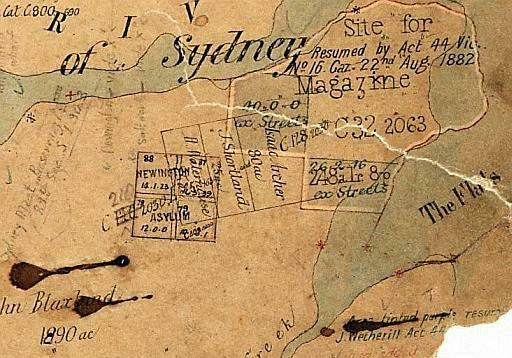 Recommendation 2 was "That a separate and distinct magazine for merchant's gunpowder, capable of storing about 300 tons, be established on the right bank of the Parramatta River...". Mr Henson was prescient; 18 years were to pass before building got under way. In the event, the commercial explosives were dispersed to storage hulks until such time as permanent magazines at Middle Harbour were completed, and the military stores to Newington. This took much longer than expected. Some military stores lingered at Goat Island until as late as 1905, when the Balmain Borough Council, acting on residents complaints of excessive noise, prevailed on the military authorities to cease the disposal there of obsolete Martini-Henry cartridges by removal of the bullets and firing of the resultant "blank" cartridges. 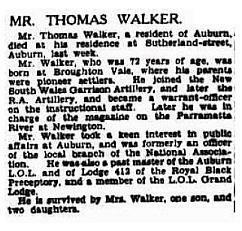 (Sydney Morning Herald, 22 March 1905, page 5). "The Government have resumed 217 acres of land at the Newington Flats on the Parramatta River, where there is sufficient dry land for the magazines ... This site was recommended by the [Storage of] Gunpowder Board, and is is intended to erect there three separate magazines protected by large mounds of earth. £20,000 have been voted by Parliament for that purpose. Plans are now being completed in the Colonial Architect's Office, and as soon as they are ready immediate action will be taken in the construction of the buildings." One of the witnesses at the Storage of Gunpowder Board hearings in 1875 was a military engineer. His evidence bore on the question of differing standards of magazine construction for commercial and military explosives. He gave as his opinion that comparatively light construction with earth traversing was appropriate for commercial explosives, rather than the heavy Vauban-style (or bomb-proof) magazine used for military explosives.¹ It is therefore likely that the Colonial Architect's design in 1883 was for lightly constructed buildings with earth traverses. In the event, by the time construction got under way in 1897 the purpose had changed to storage of military explosives and what was constructed was a heavy Vauban-style magazine. It is therefore most likely that the design of the initial buildings at Newington originated with the engineering staff of the NSW Military Forces as the 3 key buildings, the magazine, laboratory and the examining room are typical British military designs of the Victorian era. Army laboratories with similar floor plans were designed for Enoggera, Queensland c.1903, and Fort Nelson (Hobart), Tasmania c. 1918. If the buildings were designed by the military staff, then it is likely that Captain Percy Thomas Owen played a major part. Owen was staff officer to Colonel H.W. Renny-Tailyour, R.E., the Commanding Engineer of the NSW Military Forces 1891-1894, and headed the military engineering staff from 1895 to 1899. An experienced practical civilian engineer, he also qualified at the Military College of Engineering at Chatham in the UK in 1894, and subsequently had a distinguished military and civilian engineering career. A fuller biography of Owen can be found at the Australian Dictionary of Biography. According to the Report of the Committee into State Properties transferred to the Commonwealth published in 1903, the Magazine was "a comparatively new work, completed in 1898 in four contracts amounting to 17,793 pounds." Construction got underway in early 1897 and continued on through 1898. Details of two of the contracts have been traced. 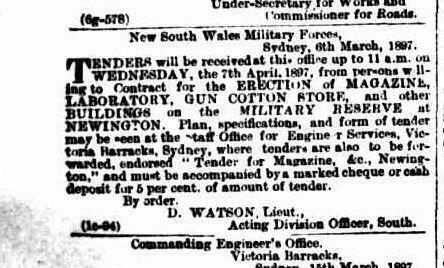 A notice appeared in the Sydney Morning Herald of 27 March 1897 calling for tenders for the erection of a "Magazine, Laboratory, Gun Cotton Store and other buildings" at the Military Reserve at Newington. The notice is in the name of the New South Wales Military Forces. Tenders will be received up to 11 a.m. on WEDNESDAY, the 15th December, for the CONSTRUCTION OF ROADWAYS, TRAMWAYS, TURN-TABLES, TRUCKS, CRANE, TRAVELLERS, LIGHTNING CONDUCTORS &c., &c., at NEWINGTON (one contract). Plans, specifications and terms of tender may be seen at the above office. Tenders to be forwarded to the Staff Officer for Engineer Services, and must be accompanied by a cheque or cash deposit for five (5) per cent of amount of tender. An article in the Cumberland Argus and Fruitgrower's Advocate of 4 September 1897, reporting on the construction of the Magazine, says that: "...the Government Powder Magazine at Newington, where it is intended to store all the powder required for military purposes in the colony..."
"There is to be a cooperage for the repairing of barrels, an examining room and a laboratory, for the making up of cartridges, and a gun-cotton store for the storage of dry gun-cotton. A convenient wharf has been placed on the river, and the river is to be deepened to the wharf. From the wharf, on which the iron gates will form the main entrance, there will be a thorough system of tram lines running around the reserve. One line will run to the gun-cotton store on the right hand side, and a double line of rails will run to the powder magazine." 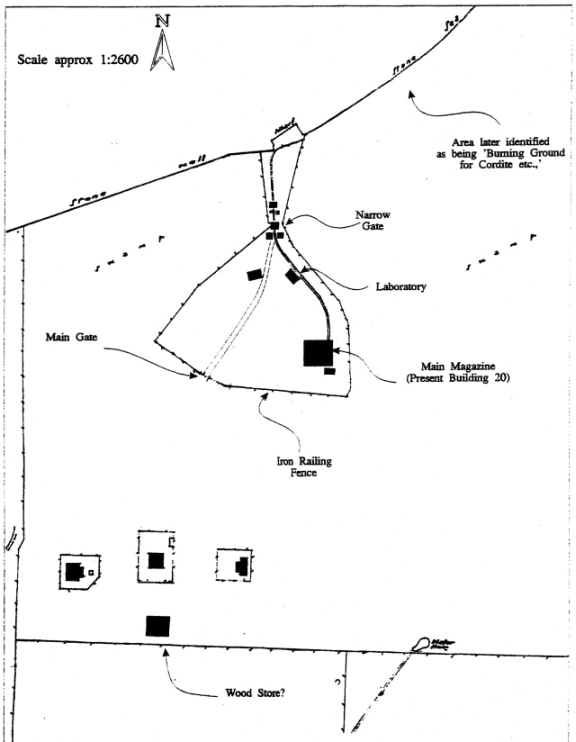 Of the buildings mentioned (there was also a latrine and soldier's quarters), all are shown on the map below, with the exception of the gun-cotton store (which is outside the area covered by the map). This map section, dating from the early 1920s, shows the original magazine precinct, its surrounding iron picket fence and tramway tracks, including those within a cutting and running to the gun cotton magazine. North is to the right. The complete map also shows the residences, empty case store and smoke apparatus store. View an album of photos showing the surviving buildings constructed at Newington in 1897-98. The gun-cotton store no longer exists. 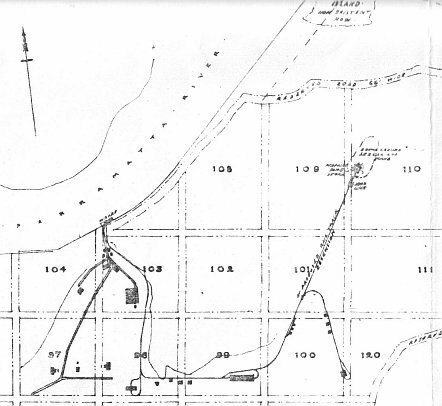 It is shown on a 1928 map, occupying a position now occupied by a later explosives storehouse (Building No. 8) erected around 1940. It had been, in any case, replaced by 3 new guncotton storehouses constructed around 1922 (Building Nos. 36-38) on the eastern side of the Depot. This map, dated 1928, shows the location for the "HMAS Albatross" bomb store (section 110), the three guncotton magazines(sections 100 and 101), filled shell and depth charge store (section 99), laboratory block "D" (sections 96 and 99) and laboratory block "B" (section 100). The original magazine precinct is in sections 103 and 104, and the residences in sections 97 and 98. Section 104 contains the original guncotton magazine, later replaced by Building No. 8. The 1897 buildings at Newington were erected by Mr John Howie, a prominent Sydney master builder, according to his obituary published in the Sydney Morning Herald of 15 October 1917. The following table relates the buildings known to have been constructed in 1897-98 with the buildings as they exist now. Dry gun cotton store Demolished Probably demolished when Bldg 8 constructed. Lamp room ? Location not positively known - most likely integral with the Guardhouse, although Building 137 is also a possibility. The original function of Building 137 isn't known, although its location indicates a functional relationship with the powder magazine. The most likely use was as a non-explosive component store or office. The powder magazine (Building 20) conforms in many respects to the general design principles set down by Marshal Sebastien le Prestre de Vauban (1633 - 1707), the distinguished French fortification architect. It is the Ordnance Store Corps, and specifically the No. 2 Magazine Section, that is likely to have been the commissioning unit at the Newington Magazine in 1898. A history of the Australian Army Ordnance Corps (available at the RAAOC Association website) says: "...On 15 September 1902 the following Warrant Officer, Non-Commissioned Officers and Gunners were attached to the newly formed No 4 Company pending transfer to the Ordnance Stores Corps....The following N.C.O. and men employed at the Newington Magazine were attached to No. 2 Company also pending transfer to the Ordnance Stores Corps. "The Commonwealth Cordite Factory is now turning out a certain amount of gun cordite. The first lots will be made up into practice charges for 4" guns and below. It is proposed to carry out this work at Spectacle Island..."
"In my opinion the magazine should be removed to a safer locality before the return of our ships and I submit that this question should receive early consideration by the Naval Board." At the conclusion of the First World War, the Naval Board not only had to consider the storage of the reserve outfits of the returning ships but also the manifest unsuitability of Spectacle Island for storage of explosives. During the latter part of 1919 the matter was taken to Cabinet, and the attention of the Prime Minister was drawn to the dangerous state resulting from the lack of ammunition reserves. "We are faced, as we have been ever since 1906, with the imperative necessity of constructing a modern magazine and shell store of sufficient size to accommodate all the reserve ammunition for the existing Australian Navy, and to allow of expansion to meet future needs; or in the event of the adoption of Viscount Jellicoe's proposals of smaller magazines and shell stores at each of the main Naval Bases. As the full proposals cannot in any case materialize for some time it is important that the magazine in connection with the Eastern Base should be commenced without delay; plans and estimates for this have already been prepared." Between March and September 1921 investigations were made into the possibility of converting a railway tunnel at Otford into magazine storage; the cost was estimated to be £248,000. Advice was then sought from the Admiralty as to the suitability of the proposal. Although the outcome of this enquiry isn't known, it's clear from the construction program that by 1923 expansion at Newington, together with the development of the Swan Island Mine Depot, had been accepted as the preferred option for the medium term. More information is available about the activities conducted at the Magazine. Information concerning the Otford Tunnel and HMS Magnificent is drawn from a contemporary "Summary of Action" referencing Navy Office files 17/0144, 21/086, 21/0145 and 21/0174. John Mortimer, "Naval Administration 1919-23: Lessons for Today�s Royal Australian Navy", Australian Maritime Issues 2008 � SPC-A Annual (Papers in Australian Maritime Affairs No. 27) ed. Gregory P. Gilbert & Nick Stewart Pp.145-194. ISSN 1327-5658/ISBN 978-0-642-29701-3. This publication can be downloaded from the Royal Australian Navy website (2.83 MB; PDF format). For further information about the Navy's development of the depot visit the RAN Armament Depot Newington in 1937 and The Experience of War at Sydney - 1939 to 1945 pages. 1. This style of construction is consistent with the recommendations of the 1865 Committee on Government Magazines and Depots of Gunpowder, which recommended that future magazine establishments should be composed of small units placed well apart and traversed, holding 2,000 barrels each. (David Evans, Arming the Fleet - The Development of the Royal Ordnance Yards 1770-1945, p.82) 2,000 barrels equals 90 tons of gunpowder.